On Thursday I realised that the following day was a clear day (no work or family things on) so I booked myself on the 8.25 ferry to Calais on Friday morning. Set off from home at about 5.45 for Dover (country 1 England), arrived there about 7.15 in time for a coffee and check in. Boarded the ferry 1st as was the only bike, had the usual fry up and settled in for the trip. Arrived in Calais (Country 2 France) and from there rode up the coast to Dunkirk where I had more coffee and a look at the beach. Carried on up the coast to Ostend (Country 3 Belgium) before heading inland for a ride around Bruges. From there I headed out to the coast where I had lunch in Cadzand Bad (Country 4 Holland) which is a nice little Dutch coastal town. After that I headed back inland to Oostburg before getting a bit lost (satnav gave up) and riding through some small towns and villages. I crossed back into Belgium, eventually picked up a motorway and headed back to France. Had time to stop at Cite Europe and fill my top box with wine and sweets before heading back to Calais. Weather was great and the only slight problem was the ferry back was delayed by 45 minutes so I didn't get home until about 9.45. Spent a couple of hours chatting to a friendly Harley rider on his way back from France too before having dinner on the ferry. All in all a really good day, its funny how the unplanned ones often are! Fair play to you there’s me thinking about using mine either next week to Le-Mans or the NW200 in May with less than half that mileage!! Never really worried about it, shes old tatty and high mileage but used every day which seems to be the key. When they sit around you get more problems. A four or five hundred mile ride never causes any problems. Shame she's got to go because of ULEZ! Regarding ULEZ, contact MAG , Motorcycle Action Group. They are having a big argument with TFL over older motorbikes and ULEZ, they want to hear from people like you who are directly affected. You are right about using the bikes frequently, they prefer to be used. Thanks Geoff, will drop them a line but any changes they do get will most likely not be in time for me, need a bike I can use very soon unfortunately. Cool trip HockleyBoy! I did a similar trip myself back in 2014. Covered a few more countries and a few more miles back then, but often wondered what it would be like to do it again but this time at a little more leisurely pace and actually take the time to explore a little more. 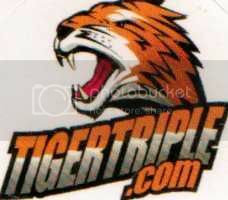 Maybe if there's a few like minded guys out there that fancy doing something similar, we could arrange to do a Tigertriple.com European tour one of the days? ?